Successfully Added Conquest S6FP Rugged Smartphone - IP68, Gorilla Glass, Quad-Core CPU, 3GB RAM, NFC, OTG, 5 Inch Display, 4G (Yellow) to your Shopping Cart. The Conquest S6FP smartphone is a fully rugged Android phone that is not only tough from the outside but also holds some serious hardware within. Running on an Android operating system this rugged smartphone delivers a smooth and lag free user experience and lets you enjoy the latest apps and movies. A beautiful 5 inch HD IPS display delivers vivid colors and truly brings media to life in the palm of your hand. Being IP68 rated this Android device is resistant against water, dust, shocks and more – making it perfect for everyday life and outdoor usage alike. Featuring Dual-SIM and 2 IMEI numbers the Conquest S6FP allows you to be connected and reachable on two different phone numbers simultaneously. Easily combine work and private life and be connected to two different 4G network providers at the same time – with this Dual-SIM smartphone you are guaranteed to always be within reach for your friends, colleagues, and family. This 5 inch smartphone additionally features NFC Technology, allowing you to simply share data files between different devices without the need of any cables. OTG furthermore enhances your user experience by allowing you to connect external hardware devices such as keyboards and memory sticks to your smartphone. Equipped with a Quad-Core CPU that has been clocked at 1.3 GHz and packing 3GB of RAM this Chinese smartphone holds some serious power under its hood. Enjoy the latest apps, games, HD movies, and more in stunningly smooth quality – the Conquest S6FP can handle whatever you throw at it without dropping a frame. With its 32GB of internal storage and the possibility to add an extra 32GB of external data, you can be assured that you won’t run out of storage space for your favorite files, movies, and music anytime soon. 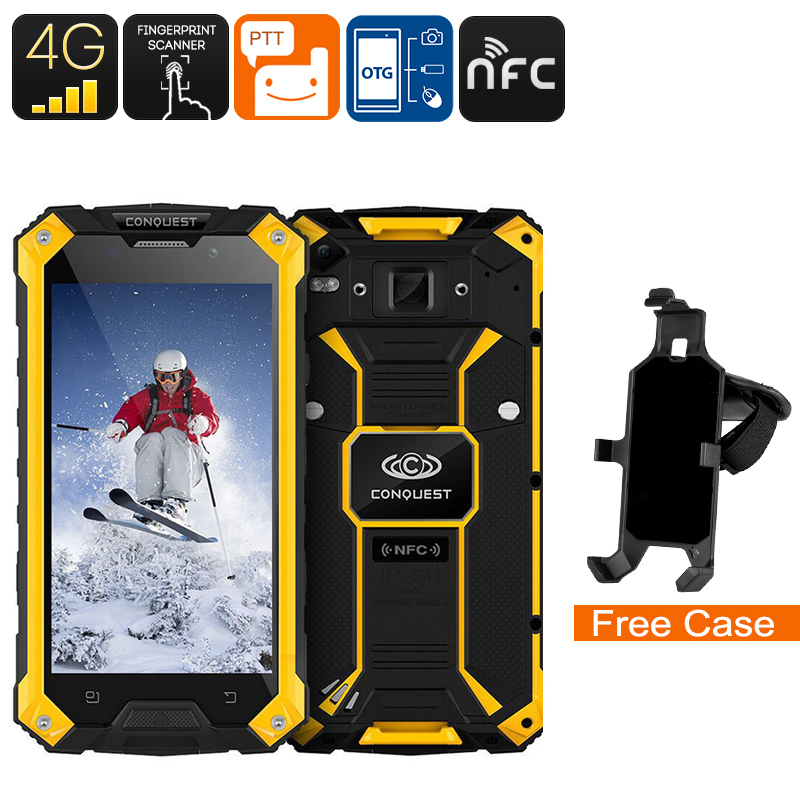 Being fully rugged this extremely durable smartphone is protected against water, dust, and shocks – making it the perfect device for outdoor enthusiasts that like to carry along their smartphone on their next adventure to enjoy some mobile entertainment on the way. A massive 6000mAh battery provides a mind blowing 16 hours of continuous usage time and 480 hours of standby time so no matter where your upcoming hiking trip takes you, with the Conquest S6FP rugged smartphone running out of battery is not something to worry about. This 5 Inch smartphone additionally features an abundance of sensors, SOS function, and 13MP camera – making it the perfect outdoor tool to have at your side during your next adventure. The Conquest S6FP smartphone comes with a 12 months warranty, brought to you by the leader in Android phones as well as wholesale electronic gadgets..